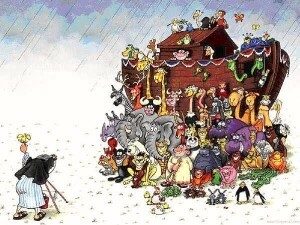 Mark Combs Author » Blog Archive » ANOTHER BOOK ON NOAH’S ARK? REALLY??? The basics of the story are fairly consistent, regardless the source. Mankind is wicked and destined to be destroyed by the Creator’s wrath. A man named Noah finds favor in the sight of the Creator and is given specific instruction to build a large boat to save his family and representatives of each type of animal. Noah builds the boat; it rains for 40 days and nights; the wicked people drown, and the Creator starts over with the preserved occupants of the ark. Having this summary as the company storyline, I’m left with a number of questions that I feel are not only worthy of consideration, but deserving of a reasoned response. Are we to just roll with the idea that the Creator is justified in annihilating every living thing on the planet because Bob and Curly Sue got a little too rowdy? The Giraffe’s gotta be thinking, “Hey now, what did I do? Did one of us eat from the wrong tree?” If everything that the Creator put in place is to be brutally exterminated, then there just has to be a better cause for the reciprocating effect. If such a cataclysmic event happened, I’ve also got a number questions about how it could unfold. “God said it and that settles it,” may be sufficient for a person of blind faith, but it doesn’t offer any consolation to the person who is genuinely in search of understanding. What are the parameters of Noah’s building project, the ark? How much water does it take to flood the earth? Where did it come from? Where did it go? What about the enormous variety of animal species that we see in the modern world? How does one go about the task of preserving the animal kingdom? End The Beginning is my personal journey through those questions and many more. It takes the reader into some unexpected territory and uncovers a number of things that have never before been connected to the flood story. This is the story that ancient documents tell and it’s supported with nearly 30 pages of footnotes that take the reader directly to the source material. This isn’t hearsay; it’s not the perspective of an imaginative author. End The Beginning is a fresh look at an ancient tale that, if true, is the most important event in the history of mankind. Each copy of the book ordered through this website will be personalized by the author. Please use the options below to provide personalization instructions when ordering.